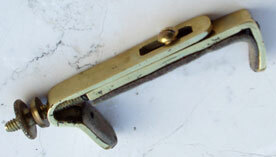 This type of capo was used on the English guitar in the mid 1800's. It was attached with a carriage bolt through holes in the neck and tightened with a wing nut on the back of the neck. 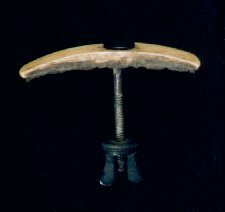 Bone with leather pad and brass bolt. On this instrument, holes were drilled in the first four frets. 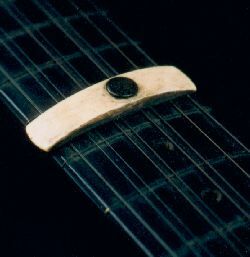 C.F.Martin made some guitars with holes in the neck around 1840, for this kind of capo. Two different models based upon the same invention. Mailorder cathalogue picture (early 1900's) from Schuster & Co, Germany. US patent 1894 by Lars L Filstrup. Here is the first Filstrup capo. The lower part has a screw soldered to one end. The screw runs through a hole in the upper part and the capo is tightened with a nut. The two parts are held together with another screw through a slot in the upper part. Leather pad. The second capo is operated with a long thumbscrew extending through an unthreaded peg attached to the upper part and a threaded peg attached to the bottom part. Cork pad with traces of red felt on the side wings. This capo is attached to the peghead with two screws and is intended for the 1:st fret only. 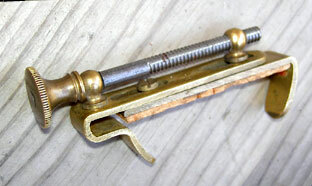 It is made of brass with a steel spring for the clamping force. When not in use the capo is pushed over the nut and the spring folds back on the peghead. Note the two small handles. US patent 1927 by Norman M Johnston. A very beautiful design, but unfortunately it doesn't work very well. Marketed in the 1960's, and was probably made in former East Germany. No patent found. Here is an individual string capo for partial capoing. Works on both single stringed and double stringed instruments. 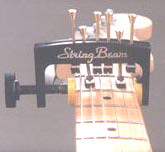 Threaded casings are mounted behind the frets, flush with the fretboard. To use the capo, a small screw with metal and rubber washers is screwed into the casing. This opens the possibility to play behind the capo. Invented by Ådin & Ekvall, Sweden. Patent pending. Partial capo for fretting individual strings. Same idea as the capo above, but here the strings are easily fretted by levers. Leather pads for neck protection. There is also a wide version for electric bass and classical guitar and a short version for banjo and other narrow neck instruments. Developed by Peter Einhorn and Frederic Hand. Marketed by Creative Tunings Inc.